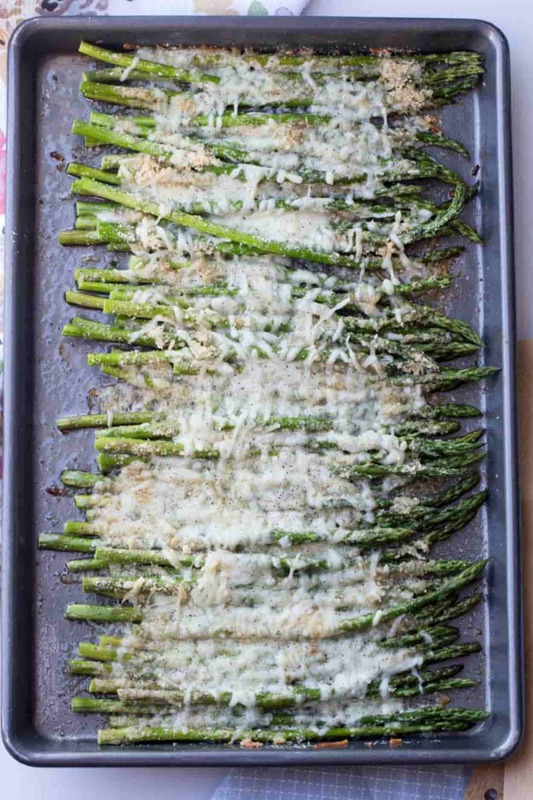 This Cheesy Baked Asparagus is so easy to make and will be a great side dish to any meal. 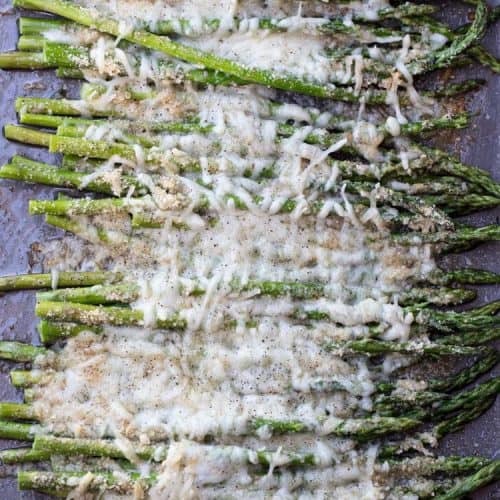 The asparagus is loaded with Mozzarella cheese, the Parmesan cheese and bread crumbs add so much flavor to the quick baked recipe. Asparagus may be baked, pan-fried, steamed or boiled. Though there are several methods for preparing asparagus. Oven baked asparagus is my favorite. The prep time is minimal with great results. How to Make Baked Asparagus? Trim ends of asparagus, layout onto a rimmed baking sheet. Drizzle olive oil over asparagus, season with salt and pepper. Toss to combine. 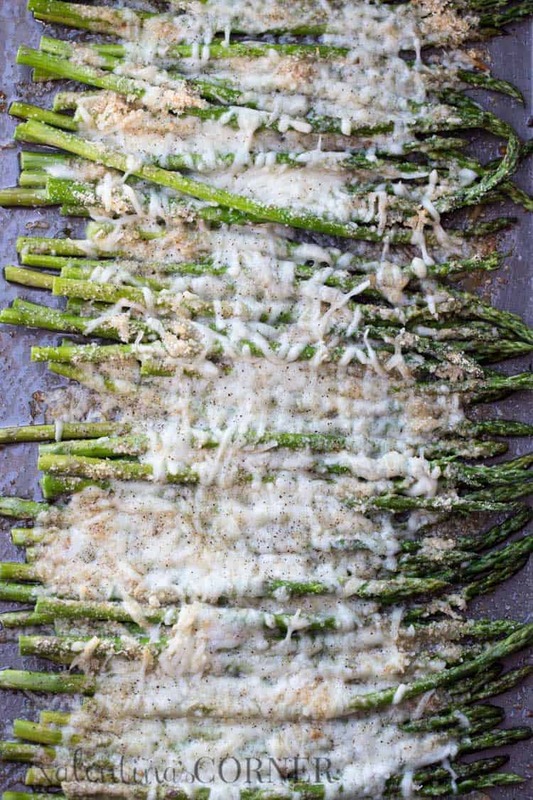 Top asparagus with Mozzarella cheese, butter, Parmesan cheese and breadcrumbs. Baked until the asparagus is desired tenderness. For best results, look for asparagus that is straight and firm and not mushy and soft. They should be a rich green and may have purple highlights. Though we used Mozzarella in this recipe, Colby Jack, Provolone or Mexican will all work. Brussel Sprouts with Bacon & Mushrooms– So easy to make. Green Bean Casserole– In a creamy mushrooms sauce. Baked French Fries Recipe– Skip frying the potatoes, baked is so much healthier. 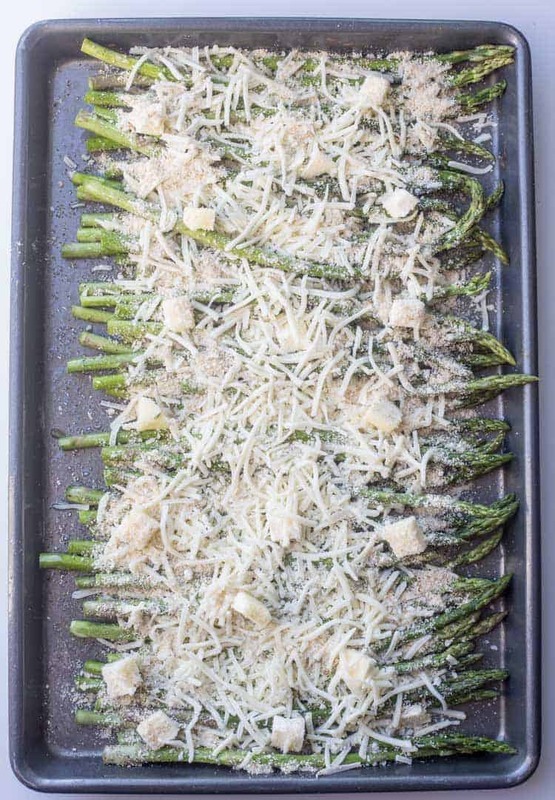 Cheesy Baked Asparagus loaded with Mozzarella cheese, butter, Parmesan cheese and breadcrumbs. The perfect side dish, or serve as an appetizer. Trim ends of asparagus and layout onto a rimmed baking sheet. Drizzle asparagus with oil. Lightly season with salt and pepper asparagus and toss. Add Mozzarella cheese atop asparagus. Add butter, sprinkle Parmesan cheese and breadcrumbs. Bake 10-12 minutes until asparagus is tender (may take longer, depending on the size of asparagus and desired tenderness). I’m so glad you kids enjoy this asparagus recipe, it truly is an easy recipe. These are so delicious and I don’t even like Asparagus. They are so crunchy yet so soft and the cheese adds the best flavor!